The ancient art of folding paper elicits self-supporting shapes that can be made to resemble nearly any familiar object, and the same principles are inspiring architects to develop larger than life structures. Architect Tal Friedman is among those looking to origami, with his newest pavilion made from eight sheets of thin aluminum. 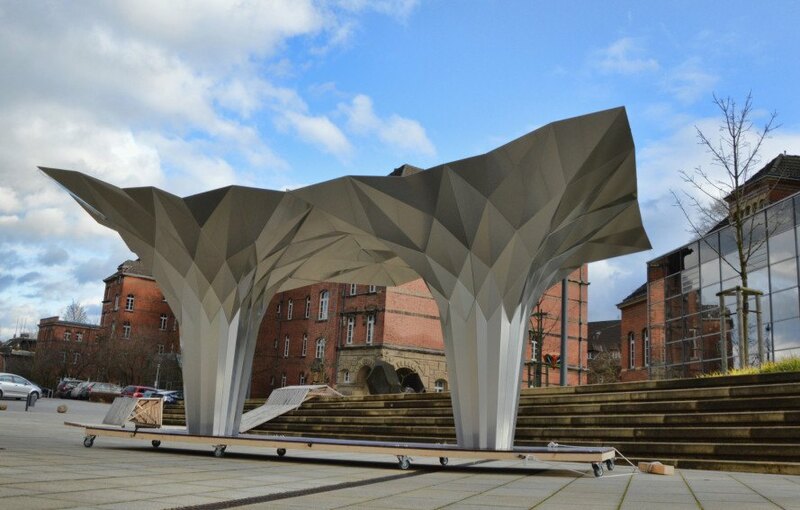 Carefully folded much like its paper counterparts, the Origami Pavilion sports seamless fabrication that provides sun shade and shelter from the elements that could inspire other types of building structures. Like much of Friedman’s body of work, his origami-like pavilion employs parametric design which relies on algorithms to make the most of the building material. In this case, that material is aluminum – both lightweight and strong – which makes it perfectly suitable for a self-supporting structure. The Origami Pavilion is comprised of eight thin sheets of the metal, folded precisely into two towering canopies that provide shade and protection from the elements. In the video above, Friedman explores the process of “foldfinding,” his name for the unique fabrication process that resulted in the pavilion. Inspired by the ancient paper art, Friedman’s design began with paper models, used to investigate shapes that might be easily translated into the aluminum medium. Little by little, the two silvery towers are erected side by side, leaving an ultra-modern echo of a thousands-year-old tradition. Like much of Friedman’s body of work, his origami-like pavilion employs parametric design which relies on algorithms to make the most of the building material. In this case, that material is aluminum - both lightweight and strong - which makes it perfectly suitable for a self-supporting structure. The Origami Pavilion is comprised of eight thin sheets of the metal, folded precisely into two towering canopies that provide shade and protection from the elements. In the video above, Friedman explores the process of “foldfinding,” his name for the unique fabrication process that resulted in the pavilion. Inspired by the ancient paper art, Friedman’s design began with paper models, used to investigate shapes that might be easily translated into the aluminum medium. Little by little, the two silvery towers are erected side by side, leaving an ultra-modern echo of a thousands-year-old tradition.